This tart little confection really hits the spot on a hot summer's day! It's also quick & super-easy to make. 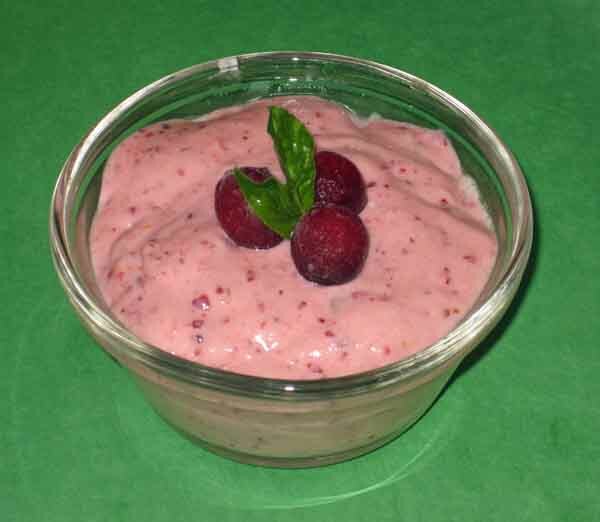 Directions: In a food processor, combine cranberries, mascarpone cheese, honey, vanilla, lemon juice, & lemon zest. Pulse for about 30 seconds, or until smooth. Pour cold water into a sauce pot, followed by the contents of the gelatin packet. Let the mixture stand for 1 minute, then cook on low heat for 2 minutes or until gelatin is completely dissolved, stirring constantly. Allow to completely cool, & then transfer gelatin to food processor, and pulse until contents are combined, about another minute. Refrigerate for at least an hour (preferably closer to 2-3 hours) before serving. Pour into glass custard dishes (or ramekins), garnish with mint leaves, and serve. Chef's Notes: If you prefer your mousse a little bit sweeter, just add another 1-2 Tbsp. honey.